Dual purpose earplugs (water, noise) with removable cord. Reusable and washable. Incredibly soft seal rings for extreme comfort. 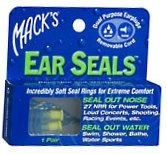 Seal out noise: 27 NRR for power tools, loud concerts, shooting, racing events, etc. Seal out water: swim, shower, bathe, water sports. Noise reduction rating: 27 decibels (when used as directed). 1. Reach over head and pull up and back on outer ear to straighten ear canal. 2. With opposite hand, grasp earplug stem and insert by pressing forward in a circular motion to form airtight seal. Use cord to hang earplugs around neck in environments where noise comes and goes. Caution: To ensure ease of removal, do not push earplug into ear so far that you are unable to easily grasp stem with thumb and forefinger. Remove cord for water activities. CLEANING INSTRUCTIONS: Wash with mild soap and warm water. Dry thoroughly before reinserting into ear. Remove slowly with twisting motion to gradually break the seal. Do not use cord for removal. Keep away from infants and small children. These earplugs are non-toxic, but may interfere with breathing if caught in windpipe which could lead to serious injury or death. Do not use for scuba diving or at depths over 10 feet. USE ONLY AS DIRECTED!